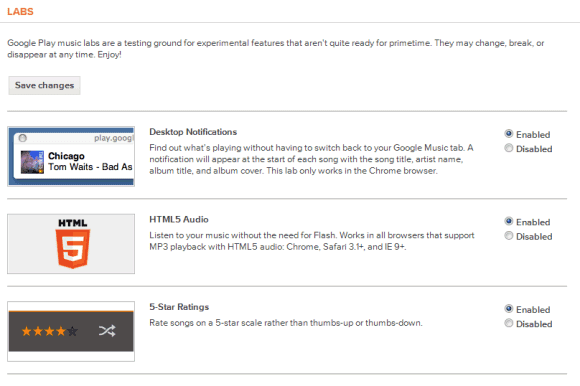 If you're looking for more features for Google Music, try the new Labs page. Google informs that "Google Play music labs are a testing ground for experimental features that aren't quite ready for primetime. They may change, break, or disappear at any time." Right now, there are three experimental features available: desktop notifications for Chrome, HTML5 audio and 5-star ratings. If you enable 5-star ratings, thumbs ups and thumbs downs will be converted to 5 stars and 1 star. HTML5 audio "works in all browsers that support MP3 playback with HTML5 audio: Chrome, Safari 3.1+, and IE 9+" and replaces the hidden Flash player that's currently used. After enabling desktop notifications, you should see an infobar that asks for permission. Click "allow" and Google Music will show a nice notification enhanced with a cover art thumbnail when a new song starts playing. Ooh. HTML5 Playback is nice! Do you mean for buying music or just uploading it? I used a proxy to log in and set it up google music months ago and it couldn't work better. I only had to log in via the proxy once, and now the syncing online to my GN or playing it off the browser works so well all the time. It's worth the few minutes it takes to skirt around it. I use a U.S. VPN server for purchasing content on Google Play Music, but to download it even to the phone a proxy or VPN shouldn't be needed. ...I'm writings this reply from my Nokia. Probably not, most Labs are different between mobile and desktop. Although I believe that the 5-star rating may come to mobile too, way better than thumbs up and down! Well, HTML5 audio is already used in the iOS/Android interface and desktop notifications are only available in the desktop Chrome. There's no mobile Google Music Labs. 5-star ratings were the ones keeping me out of Google Music, now I can come back. Does it import ratings properly from iTunes? Can it sync the ratings with iTunes? You probably have to hand-copy the settings. This sounds like an App opportunity. Actually we keep your ratings from iTunes, including songs that you uploaded before you enable the lab. unfortunately, my ratings from iTunes are not synced to Google Music. I think I have the most recent version of the Music Manager as it just restartet itself (1.0.35.3998). Any ideas? It's just available in US for now. I can't try that in Indonesia. Google play when is it available in the UK? Google jugar cuando esté disponible en la India? How could I make work in Android? It seems my mobile phone html5 ready.